Load balancing provides a higher level of availability and scale by spreading incoming requests across virtual machines (VMs). 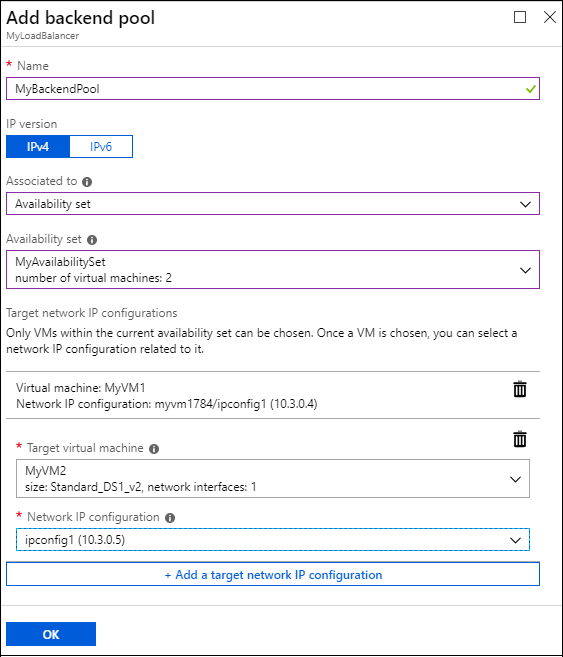 You can use the Azure portal to create a load balancer and balance traffic among VMs. This quickstart shows you how to create and configure a load balancer, back-end servers, and network resources at the Basic pricing tier. To do the tasks in this quickstart, sign in to the Azure portal. First, create a public Basic Load Balancer by using the portal. The name and public IP address you create are automatically configured as the load balancer's front end. Resource group Select Create new and type MyResourceGroupLB in the text box. Public IP address Select Create new. In the Review + create tab, click Create. Next, create a virtual network and two virtual machines for the back-end pool of your Basic load balancer. On the upper-left side of the portal, select Create a resource > Networking > Virtual network. ResourceGroup: Drop down Select existing and select MyResourceGroupLB. Subnet > Name: Type MyBackendSubnet. On the upper-left side of the portal, select Create a resource > Compute > Windows Server 2016 Datacenter. Subscription > Resource Group: Drop down and select MyResourceGroupLB. Instance Details > Virtual machine name: Type MyVM1. Drop down and select Availability set. Select Create new, type MyAvailabilitySet, and select OK. Select the Networking tab, or select Next: Disks, then Next: Networking. To create a new network security group (NSG), a type of firewall, under Network Security Group, select Advanced. In the Configure network security group field, select Create new. Type MyNetworkSecurityGroup, and select OK. Select the Management tab, or select Next > Management. Under Monitoring, set Boot diagnostics to Off. Review the settings, and then select Create. Follow the steps to create a second VM named MyVM2, with a Public IP address of MyVM2-ip, and all the other settings the same as MyVM1. In this section, you create network security group (NSG) rules for the VMs, to allow inbound internet (HTTP) and remote desktop (RDP) connections. Select All resources on the left menu. From the resource list, select MyNetworkSecurityGroup in the MyResourceGroupLB resource group. Under Settings, select Inbound security rules, and then select Add. Source service tag: Select Internet. Destination port ranges: Type 80. Destination port ranges: Type 3389. 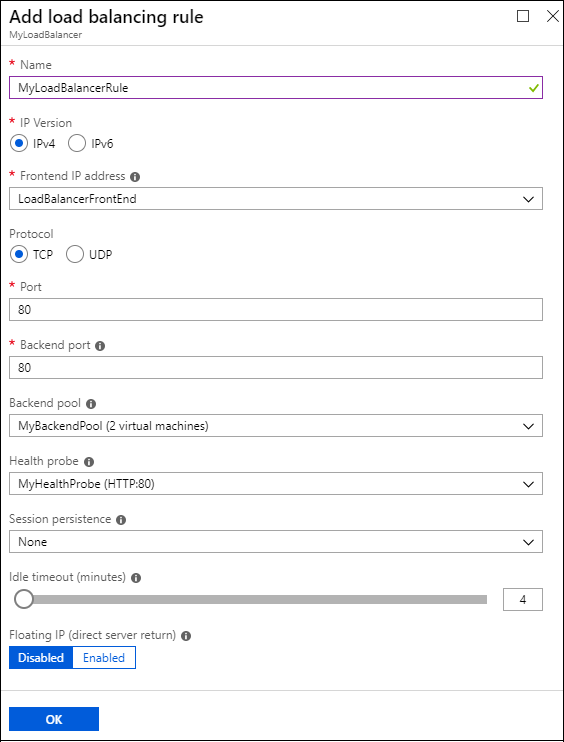 In this section, you configure load balancer settings for a back-end address pool, a health probe, and a load balancer rule. Select All resources on the left menu, and then select MyLoadBalancer from the resource list. To allow the load balancer to monitor VM status, you use a health probe. 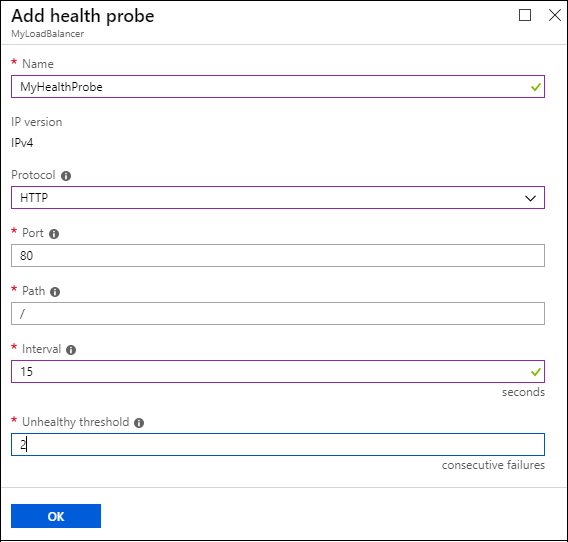 The health probe dynamically adds or removes VMs from the load balancer rotation based on their response to health checks. Under Settings, select Health probes, and then select Add. Interval: Type 15. Interval is the number of seconds between probe attempts. The load balancer rule named MyLoadBalancerRule listens to port 80 in the front-end LoadBalancerFrontEnd. The rule sends network traffic to the back-end address pool MyBackEndPool, also on port 80. Frontend IP address: Type LoadBalancerFrontend. You'll use the public IP address to test the load balancer on the VMs. In the portal, on the Overview page for MyLoadBalancer, find its public IP address under Public IP Address. Hover over the address and select the Copy icon to copy it. Install Internet Information Services (IIS) on the virtual machines to help test the load balancer. In the portal, select All resources on the left menu. From the resource list, select MyVM1 in the MyResourceGroupLB resource group. On the Overview page, select Connect, and then select Download RDP file. Open the RDP file you downloaded, and select Connect. On the Windows Security screen, select More choices and then Use a different account. Enter username and password and select OK. Respond Yes to any certificate prompt. The VM desktop opens in a new window. If Server Manager is not already open on the server desktop, browse to Windows Administrative Tools > Server Manager. In Server Manager, select Add roles and features. On the Select destination server page, select MyVM1. On the Select server role page, select Web Server (IIS). At the prompt to install required tools, select Add Features. Accept the defaults, and select Install. When the features are finished installing, select Close. Repeat the steps for the virtual machine MyVM2, except set the destination server to MyVM2. Open a browser and paste your load balancer's public IP address into the browser's address bar. 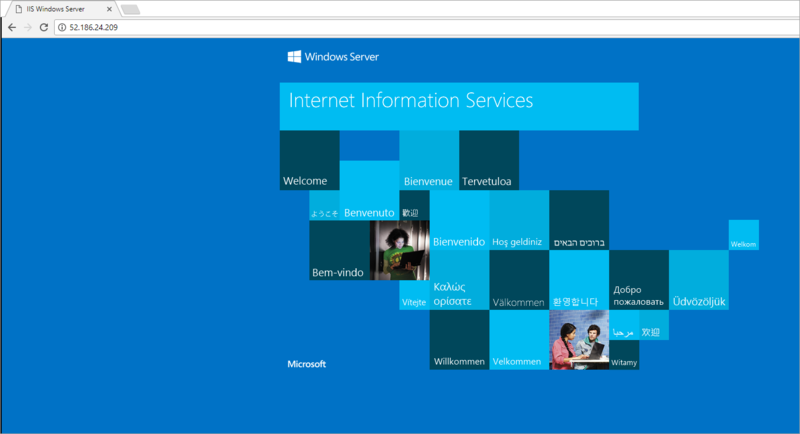 The IIS web server default page should appear in the browser. To see the load balancer distribute traffic across all three VMs running your app, you can force-refresh your web browser. To delete the load balancer and all related resources when you no longer need them, open the MyResourceGroupLB resource group and select Delete resource group. In this quickstart, you created a Basic-tier load balancer. You created and configured a resource group, network resources, back-end servers, a health probe, and rules to use with the load balancer. You installed IIS on the VMs and used it to test the load balancer. 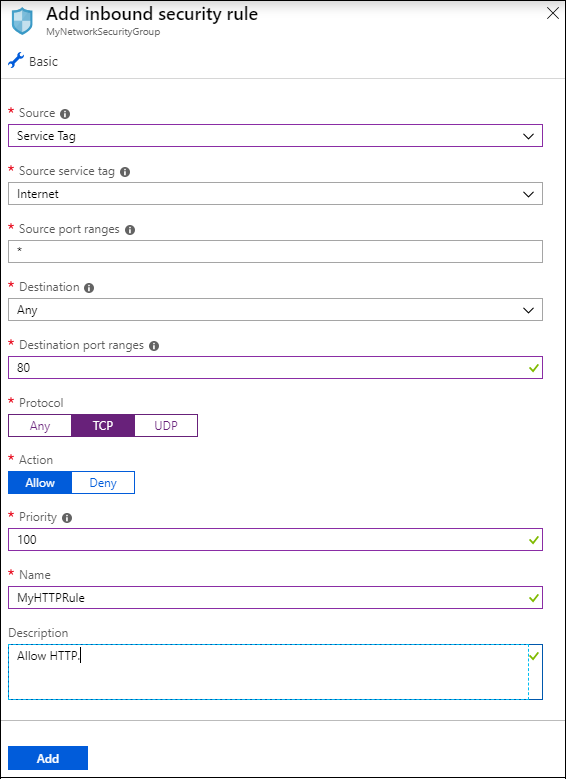 To learn more about Azure Load Balancer, continue to the tutorials.